AN reported the initial cracked beam Tuesday afternoon. The Chronicle reports that the initial fissure discovered in a steel structural beam supporting the transit center’s 5.4-acre, PWP Landscape Architecture–designed park measures roughly 2-1/2 feet long by four inches deep and runs across the bottom of a 60-foot-long spanning element located above Fremont Street between Mission and Howard Streets on the transit center’s east side. The second damaged steel beam that was discovered runs parallel to that element and features a crack that is “slightly smaller,” according to the report. 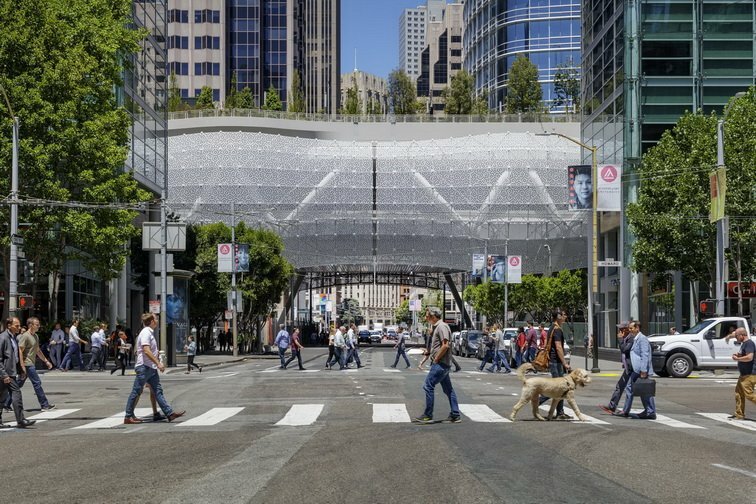 As a result of the escalating situation, the transit center will remain closed at least through October 5 as crews work to investigate other elements of the structure, according to the Transbay Joint Powers Authority (TJPA), the entity that oversees the transit center and managed its construction. Pelli Clarke Pelli Architects designed the terminal as well as the Salesforce Tower located next door. Officials at TJPA are worried the structural elements might fail and are therefore operating with a high degree of caution with regards to keeping the transit center closed. The steel beams in question were fabricated in Stockton, California, by Herrick Corp. as part of a $189-million contract struck between Skanska USA Civil West of New York and TJPA. TJPA authorities are inspecting the structure with the project contractors—Webcor and Obayashi entered into a joint venture for the job—and structural engineering firm Thornton Tomasetti, which was the engineer of record for the structure and also performed construction work on the building. Those authorities also plan to bring in independent engineers to reassess the facility’s design. AN will continue to report on this story as it develops.